The service was started in 2007 by the Akgünler maritime company here in North Cyprus and the timetable has since run for the months of May through to the end of September. Originally the route just went from Famagusta to the Syrian port of Latakia (or Al Ladhiqiyah to those from Syria). However, it has since expanded to incorporate the Lebanese port of Tripoli (or Tarabulus to those from Lebanon) at the northern tip of the country. Hence you can now travel to both countries should you wish. Sailings at the time of writing depart from Famagusta every Monday at 12 noon and return from Latakia every Thursday at 11am. There were no timings for Tripoli though as the service had finished when we enquired but will start again in 2010. Ticket prices for a return journey cost $310 per person and hotel accommodation could be arranged via their partners if required. Total journey time is around three and a half hours, making it a pretty short journey if you are looking for a short break holiday. The service has run into some difficulties in form of objections from south Cyprus, who have raised issue with the fact that Lebanon has allowed transport links with an unrecognised state, but as it is not a direct link yet, the Lebanese government are happy to let the service continue. 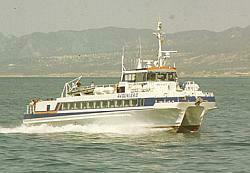 Plans by Akgünler are however afoot to obtain a direct ferry link in the future. So, unfortunately even though this article is a little late for you to catch a ferry this year, keep your ears alert for the start of the new season next year. To find out more about the service you can check Akgünlers website, or for more general information on Ferry Boat travel to and from North Cyprus click this link.